chris collins (fletcher north carolina) on 2018-07-23 19:01:52. Bill Gammon on 2007-12-22 12:26:23. N7W's J Class steam engine was second to none. When in the navy I road behind one of the 600 many times and one returned me home after my tour was over. I never thought they would ever be replaced by a diesel. I can truthly say when a passerager was passing I always had to stop and watch. I'm even angry with the N7S from removingg them from the once a year run through Portsmouth. Well 8 years later in 2015, 611 is back in operation, but makes some managements with the North Carolina Transportation Museum in Spencer, as well as Roundtrips from Roanoke to Walton, Lynchburg, Manassass, Front Royal & many other trips in North Carolina & Virgnina. Ron Harber (Strafford MO US) on 2019-02-15 00:10:07. 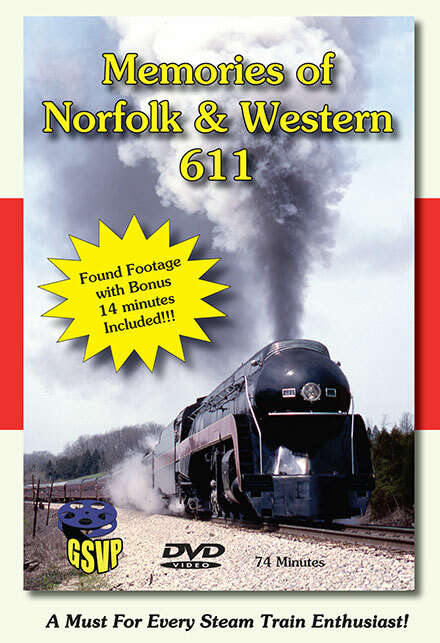 This one is probably my personal favorite N&W 611 movie. From 1982 to 1994, she pulled trains along the old N&W Cincinnati Line where the Scholl family used to live there in the 50s between Cincinnati & Columbus, Ohio. September 21, 1994 was the last time 611 used the wye at Portsmouth, as there is no direct connections between the two cities and she has be turned on the wye to head North, and less than 3 months later the railroad decided to cancel the whole program due to major crisis and safety and America was never the same again after December 1994. Extra bonus footage was added in the DVD as part of the lost tape was founded after the original editing. Steamboy (Revere MA US) on 2016-08-17 13:39:06. While Majority was shot in the Betacam years (June 1992-September 1994) There was Some JVC Era leftovers with 611 at Ludlow in 1990 In the Opening & Closing Credits, Plus 1218 In August of 1991 heading west on The Peavine line.